Alfredo Daza is well known for his interpretations of the Italian repertoire, which he expanded over the last few years with such Verdi roles as Francesco Moor in I masnadieri, Rodrigo in Don Carlos, Ford in Falstaff and Renato in Un ballo in maschera. His interpretation of Giorgio Germont in La Traviata, which he debuted in 2006, brought him to the Staatsoper Hamburg and New National Theatre Tokyo in 2015, where he sang the same role in a production directed by Phillip Boussard and conducted by Yves Abel. In the same year, Daza debuted as Valdeburgo/Leopoldo in Bellini’s La straniera, opposite Edita Gruberova. This year, he sang Scarpia in Puccini’s Tosca at the Theater St Gallen and debuted yet another Verdi role: Paolo Albiani in Simon Boccanegra at the Staatsoper Berlin, oppoiste Plácido Domingo. As first baritone of the ensemble at the Staatsoper Berlin, Daza has appeared there over the years in such roles as Almaviva in Le nozze di Figaro, Guglielmo in Cosi fan tutte under Daniel Barenboim, Belcore in L’elisir d’amore, Figaro in Il Barbiere di Siviglia, Prodoscimo in Il Turco in Italia, Yeletzki in Pique Dame under Daniel Barenboim, the title role in Hans Zender’s world premiere of Chief Joseph, Marcello in La Bohème, Sharpless in Madama Butterfly, Ping in Turandot, Lescaut in Manon under Daniel Barenboim, Valentin in Faust, Ford in Falstaff, Germont in La Traviata, and Conte di Luna in Il Trovatore. Daza has sung several roles at the Los Angeles Opera, including Figaro in Il Barbiere di Siviglia, Ping in Turandot and Marcello in La Bohème. In 2014, he returned to Los Angeles to sing the role of Tadeo in Dulce Rosa, an opera based on a novel by Isabel Allende, conducted by Plácido Domingo. Next season, Daza will return again to sing his first Zurga in The Pearl Fishers. At the age of 20, Daza toured Japan as Guglielmo in Cosi fan tutte, later singing the same role for his debuts at the Michigan Opera Theatre, San Francisco Opera and Staatsoper Berlin. He made his debut at the Teatro Comunale di Bologna as Ford in Falstaff under James Conlon and was heard in the same role at the Staatsoper Hamburg under Simone Young. In 2009, Daza made his debut as Belcore in L’elisir d’amore at the Glyndebourne Festival, and in 2013 he made another important debut with his interpretation of Sir Robert Cecil in the premiere of Benjamin Britten’s Gloriana at the Staatsoper Hamburg. Alfredo Daza began his vocal studies at the Puebla Conservatory in Mexico at the age of 12, later continuing his musical education at the Mexico City Conservatory. At the age of 21, the Mexican baritone started his international career as an Adler Fellow in San Francisco Opera’s renowned young artists program. Shortly after finishing up the program, Daza debuted in several North American and European theaters, singing Schaunard in La Bohème at the San Francisco Opera, Théâtre Royal de la Monnaie in Brussels and Canadian Opera Company in Toronto, and debuting as Valentin in Gounod’s Faust at the Teatro Carlo Felice in Genoa and as Dandini in La Cenerentola at the Teatro dell’Opera di Roma. At the Washington National Opera, he sang Marcello in La Bohème and the title role in Il Barbiere di Siviglia, the latter becoming one of his most celebrated roles. 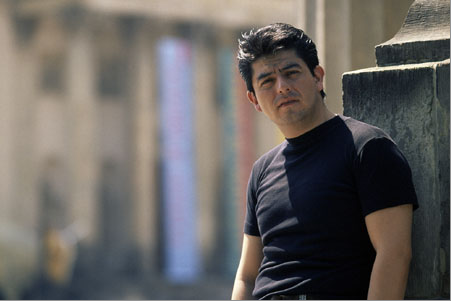 Daza also sang Marcello in a new production of La Bohème at the New York City Opera, a performance that was transmitted throughout the United States as part of the “Live from Lincoln Center” series. Daza has worked with such notable conductors as Massimo Zanetti, Antonio Pappano, Gustavo Dudamel, Simon Rattle, Daniele Callegari, Daniele Rustioni, Daniel Oren, Maurizio Benini, Kent Nagano, Andris Nelsons, Antonello Allemandi, Vladimir Jurowski and Plácido Domingo. Recordings on DVD include La Bohéme with the New York City Opera for PBS, L’elisir d’amore with the Glydenbourne Festival for OPUS ARTE, L’elisir d’amore with the “Opera de Bellas Artes” for FONCA, and Massenet’s Manon with the Staatsoper Berlin for Deutsche Gramophone. He has also appeared on the albums “Stolen Notes: Verdi Arias & Duets” with the Parma Opera Ensemble and “Rimsky-Korsakov: Angel & Demon” with Anna Samuil, both for MSM Records.